A bicycle pump is one of those essential pieces of cycling equipment that no-one should cycle without, whether on a quick jaunt to the shops, or a cycling expedition around the world. Choosing a good pump for bicycle touring like the Topeak Mini Dual DXG Pump, is perhaps one of the smartest things you will do when preparing for a long distance cycling trip. A suitable pump needs to be well made, durable, up to the job, lightweight, and not too bulky. Ideally, it should also have a pressure gauge, so that tyres can be inflated to the correct pressures. Enter the Topeak Mini Dual DXG pump then. 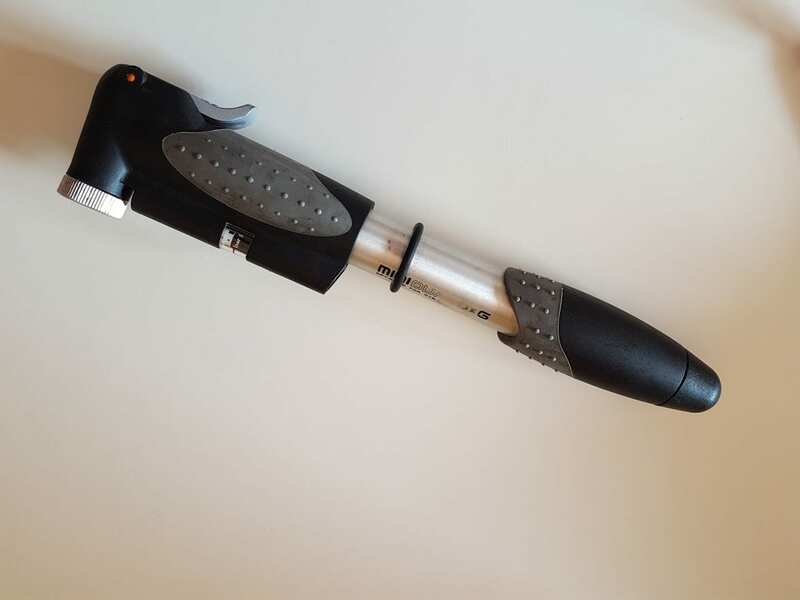 A compact and affordable bicycle pump that has been around for a few years, showing that if something is well designed from the outset,there is no need to keep altering it every 12 months. At first glance, the Topeak Mini Dual DXG Pump is a deceptively simple piece of gear. After all, a bicycle pump really only has to do one thing, and that's put air into an inner tube! However, on closer inspection, it has four design aspects which make this pump perfect for bicycle touring. Firstly, it weighs only 170g which is practically nothing in the grander scheme of things. Secondly, it has an ‘all valve solution', which means it can inflate inner tubes with both Schrader and Presta valves without the need to change any adapters. Thirdly, it inflates inner tubes both on the pull and the push actions, and finally, it has a pressure gauge. In fact, the pressure gauge is one of the main reasons that I bought this pump in the first place. For far too long (make that 25,000 kms of bicycle touring), I have never used a pump with pressure gauge. My theory when it came to inflating tyres, was that when the tyre was solid enough, I would stop pumping. The pressure gauge on the Topeak Mini Dual DXG pump takes all the guess work out of it now. On my current bike, I am running Schwalbe Marathon tyres, which say that the minimum inflation level should be 3 bar, and the maximum 5 bar. It's pretty apparent after using the pump a few times, that I have been under-inflating my tyres for years! Whoops! As a side note, inflating the tyres to 4 bar gives me the best results at the moment. There's not a lot more to say about the Topeak Mini Dual DXG pump really. At just over £16.00 when I bought it, it offers good value for money, and does what it says on the tin. If it's like any of the other Topeak pumps that I have owned, it will keep on going strong for years. It also has a spare O-ring supplied should one need to be replaced.